Not so long ago, American men wore neckties on “dress-up” occasions. In addition, if you worked at a desk, behind a bank window, in a classroom, or in most retail sales positions, a tie was part of the uniform of your occupation. Today, however, the necktie has become something of an anomaly. Sure, lawyers still wear them ubiquitously. So, of course, do judges in court; there is even a similar neckwear worn by female judges. Doctors, however, are beginning to abandon the tie – not because of a turn to casual attire but because they have been found to be a harbor for germs that can transfer from one patient to another during the doctors visit. The ones who seem to be deserting the necktie at the most rapid pace are politicians. Although it is true that Donald Trump almost invariably wears one for public appearances (and puts his name on his own brand of them), Barack Obama often gave speeches with no tie and an open shirt collar. Many other male political figures are doing the same in public appearances, particularly when campaigning or trying to sell a political idea. It appears not to be a matter of comfort. It is as if the tie conjures an image of snooty elitism that is now in disfavor. Many years ago, when I was in Hong Kong, I was advised that if I saw someone with a very long thumbnail, I could be confident that the person was a fortune-teller. The long – sometimes grotesquely so – nail was the trade mark of the profession. It reminded me of a time in graduate school when I had had a classmate from Vietnam. I noticed that, on each hand, he kept the nail of his little finger unusually long and well-shaped. Perhaps it was indicative of his status as a scholar. In our culture, one of the functions of the necktie was to allow the man in a sober professional navy blue suit and white shirt to express a splash of color or a little individuality in his attire. But its main purpose was to make an announcement about the wearer. It declared something about his status in life. It was the Western equivalent of the long nail. What caused men to take up wearing ties in the first place? It cannot be that the necktie was designed to protect the shirt from drips, spills, or other accidental soiling. 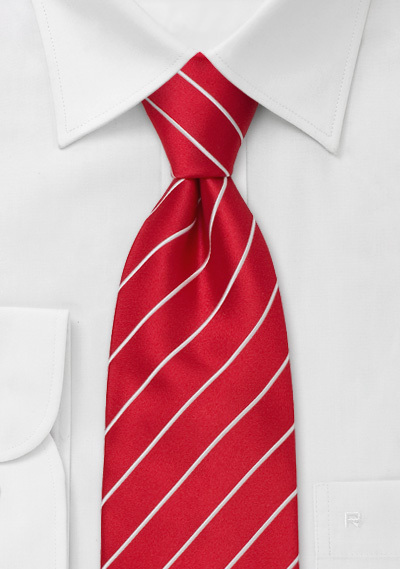 After all, the tie almost certainly cost more than the shirt, and it is more expensive to clean if it gets dirty. In addition, it is not worn in any occupation where the danger of getting the shirt dirty is present. So why, then? What is the function of the necktie? That is easily determined by asking the question, “What can’t you do while wearing a tie?” The answer is, “anything where the tie might be a hindrance or a danger.” A house painter, warehouse freight handler, or plumber would find a necktie not only useless but also constantly in the way. An auto mechanic or other worker servicing or using power equipment would endanger his life by wearing a tie on the job. Something similar could be said about the long nails on the hands of an East Asian fortune-teller or academic – they would be in the way and it would be impossible to keep them long and neat. Therein lies the reason for the tie. By wearing an item of clothing that is physically useless and indeed a potential danger in certain occupations, one who puts on a necktie every day is proclaiming to the world that he is of a status that is above manual labor. It does not have much to do with income. Plumbers and electricians make more than retail clothing salesmen, and the income of an auto-assembly plant worker can exceed that of a bank loan officer. Another hint is in the terminology used to differentiate service workers from production and labor workers: “white-collar” vis-à-vis “blue-collar.” The white collar surrounds a tie and announces that the wearer is of a station that does not perform manual labor. It is intended as the adornment of a “thinking man” rather than a “working man.” The wearer of a tie is announcing his perceived higher status. There is even an odd corollary to the “who-wears-a-tie” issue. The status symbol spills over to the vehicle the wearer is driving on the job. To wear a tie while driving a “working” vehicle can seem incongruous. The driver of a pickup truck who wears a tie seems out of place – unless he is also wearing a hard hat. In this way he implies that he is an engineer or other university-trained professional who is making a visit to the job site of a major project. The rapid rate at which politicians are shedding their ties and unbuttoning their shirt collars suggests another instrumentality at work. The office-holder or office-seeker who talks of his love for and identification with the common people has always sought ways to identify with Joe Lunchbucket and Sally Housecoat. The vote-seeker must make the everyday voter think he is one of them by distancing himself from the Enemy of the People. Today’s political atmosphere is one in which the Enemy of the People is not the radical labor agitator, not the anarchist or leveler. It is the detached, self-important “elitist.” The ones to be feared and loathed are the self-serving, out-of-touch snobs who look down on ordinary folk. They’re the ones who wear neckties.